A couple of weeks ago I flew from Vancouver to Toronto for my mother’s 80th birthday. I felt this was a special enough occasion to warrant spending too much money and being treated with complete disdain while wedged into a tiny seat with leg room ample enough for a toddler (though it would appear that even toddlers have issues with leg room on airplanes, hence the need to constantly kick the seat in front of them). When did airplane travel become something to be dreaded more that a trip to the dentist for three root canals? 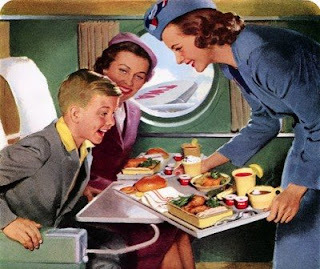 Am I the only one who remembers the excitement of a vacation that involved airplane travel? It meant that we were going too far to drive so it was bound to be more exotic than the usual visit to cousin Bernice in Detroit. It meant we didn’t have to load up the car with suitcases, coolers, lawn chairs, pillows and blankets (because the hotel/motel/family/friends didn’t have pillows and blankets that we could use? ), the dog – and make frequent stops for pee breaks, coffee breaks and “Ooh look, Storybook Gardens. We really must take embarrassing photos of Lianne that will haunt her for the rest of her life”. It meant getting up and walking around without being told to quit squirming, talking to strange and interesting people from all over the world, using tiny utensils and even tinier salt and pepper shakers to season a surprisingly palatable meal. It meant watching a movie on a little monitor anchored into the ceiling at a distance that was either just too far, or way to close to really be enjoyed, but not caring. We were in an airplane for god sake. Watching a movie! The stewardesses were all young, slim, sweet and pretty and the stewards were all, well, um…stewards. Their primary function was to ensure each and every one of us had the most enjoyable and positive experience imaginable. CP Airline’s slogans were “Civilized Air Travel” and “Our World Revolves around You”. It was and it did. It was a golden era (sigh). But those days, like the days of car bumpers being able to withstand being bumped into, have long since vanished. Air travel today is neither enjoyable nor palatable. Just getting through security at the airport has become a thing of unbelievable frustration. You must now take off our clothes, drink a barium cocktail then pass through a full body x-ray machine. On the other side of the archway you then stand naked, spread-eagle, awaiting the cavity search while being scanned with a handheld metal detector. Meanwhile your personal belongings are being torn apart by a rabid beagle looking for that tube of lip gloss that wasn’t in your one clear, closed and resealable plastic bag with a capacity of no more than 1 litre, the approximate dimensions of which are to be 15 cm by 23 cm or 20 cm by 18 cm . (One bag per passenger please.) Once given the grunt of approval, you must then attempt to put on your clothes, repack your luggage, find your laptop and appear calm and collected as the airport security person is trying to yank the grey bin out from underneath your possessions while muttering that you are holding up the line. And this is considered a normal experience. Don’t even think about trying to clear security if you are 5 years old and on the Do Not Fly list. Dressed (hopefully in your own clothes, but by now any will do), you try to find your gate, whose location is always in direct correlation to how soon your flight departs (3 hours till departure, it will be the first gate. Departing in 5 minutes, it will be at the opposite end of the terminal, behind the snack counter, under a tarp). Add to this the kicking child previously mentioned, the woman in front of you who feels that just because her seat reclines then she must recline, the 6 ½ foot tall man behind you whose knees are coming through the back of your seat (which you have politely not reclined), the movie playing is Fearless (which does happen to have what I believe is the best plane crash scene ever! ), and you are sitting by the emergency exit and have been instructed by the flight attendant that the lives of everyone onboard depend on you being able to remember the instructions that were on the in-flight video (which she won’t repeat because you should have been paying attention), and flying has become something to be avoided if at all possible. We still want to see the world and need to travel for business and visiting far flung relatives, but the collective delusion surrounding air travel is crumbling. Too much hassle, too expensive, too little service. People are rediscovering the joys of train travel, and do I dare admit the good ol’ road trip. Have you not noticed planes falling from the skies these days? For no apparent reason? I shudder as to the possible reason why. Amen to that! Excellent writing~"We're not happy till you're not happy...Hah! Oh hun, you do great blogging!